The religious sphere in the Inca civilization, was basically made up of the same deities that cultures that preceded it, suffering slight variations in appearance and denominations. Chavin, Caral until Huari and Inca, through Nasca and Mochica, the god of water was the highest deity of life in the Andes. Huiracocha, Kon, Ai Apaec, Illapa, they are just names for the great god giver of life and ordering rainfall makes agriculture possible. The historian D. Kauffmann calls them "gods of sustenance" in reference to his intervention in obtaining food. More than gods land makers, the Incas worshiped that provided them food, hence the divine couple of the Andean Worldview, formed by Huiracocha (water) and Pachamama (Mother Earth). The water god fertilized the Pachamama. To be broken this balance, the Pachamama stop producing and shortages ensue and with it hunger. To be broken this balance, Pachamama would stop production and shortages ensue and with it hunger. Next to the couple in charge of fertilizing the land, appear, the Inti, Sun god, giver of light and who allowed to read the weather stations and also create agricultural cycles; Illapa, god of lightning another version of the god of water of pan-Andean origin; also called Libiac, qhoa, winged feline served Huiracocha among other lesser gods. Throughout the Inca culture, there was a sort of tradition of pilgrimage. Organizers of the Andean area, were sacred symbols, places where people were concentrated to worship, their gods, accepting the rule of the representatives of the supernatural powers on earth. Huiracocha created lakes and ponds, it was inexhaustible source of life. The Apus were considered male deities. To these worshiped them, from small domestic units, to the highest Inca elites of society, and other kingdoms and dominions. The arrival of the Spaniards, came with the imposition of western religion, which endorsed, mixing them with their customs, so as to be visibly acceptable to the invaders of the West. There is record in many ways in which the Incas demonstrated their devotion, between them, the images of the errants. Pilgrims visiting the origins of their devotion. And the imaginary wanderings on the sanctuaries, special places located in the territory. These are the antecedents material and spiritual that have led to religious customs contemporary. The devout pilgrim who walked on this earth and its history, was part of the memory of a country. Proof of this can give the current pilgrimages, which are a mixture, with much influence of the Western culture of the Spanish invaders, and the ancient Inca culture. Such as La Candelaria, the Virgin of Carmen, the Virgin of Guadalupe, the Virgin of Cocharcas and many others. They formed Christs walkers on sacred mountains. Devotion is associated with trade in goods and feelings. 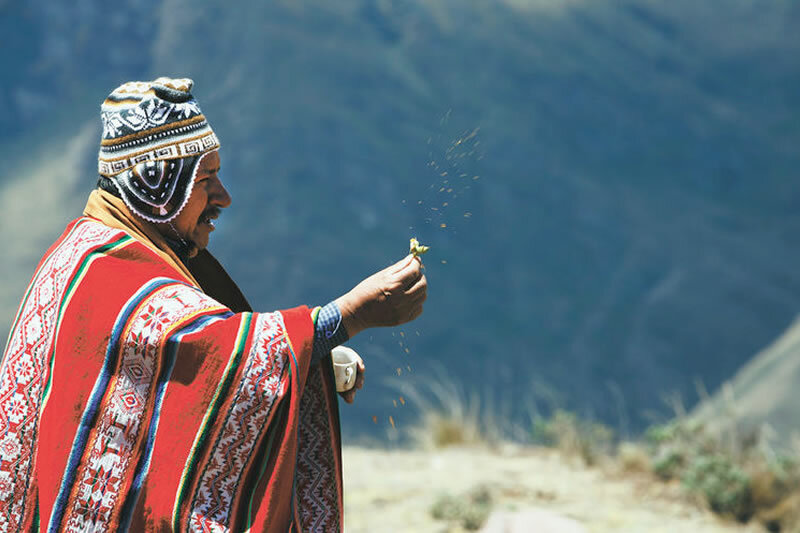 In the vicinity of Maras, in front of snowy of Chicón, there is a solitary church, that each year attracts thousands of pilgrims and travelers who meet on 17 August to exchange goods (barter), pray and dance, all accompanied by a huge popular devotion, this tradition for centuries.